Authentication based on smart cards is an alternative to password-based authentication. User credentials are stored on the smart card, and special software and hardware is then used to access them. In order to authenticate using a smart card, the user must place the smart card into a smart card reader and then supply the PIN code for the smart card. The following sections describe how to configure a single system for smart card authentication with local users by using the pam_pkcs11 and pam_krb5 packages. Note that these packages are now deprecated, as described in Deprecated Functionality in the 7.4 Release Notes. To configure smart card authentication centrally, use the enhanced smart card functionality provided by the System Security Services Daemon (SSSD). For details, see Smart-card Authentication in Identity Management in the Linux Domain Identity, Authentication, and Policy Guide for Red Hat Identity Management. 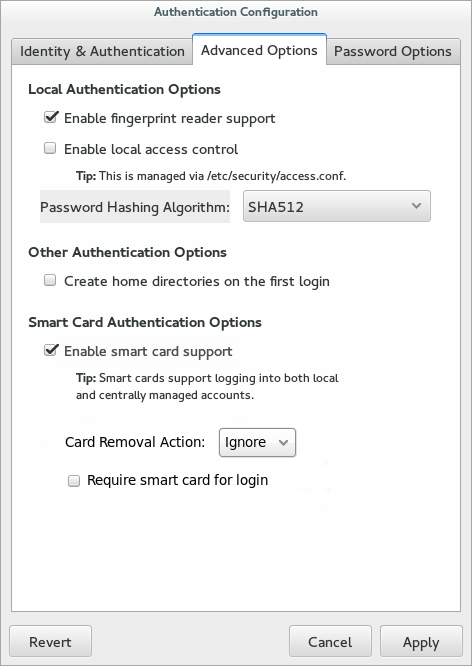 Once the Enable smart card support option is selected, additional controls for configuring behavior of smart cards appear. Note that smart card login for Red Hat Enterprise Linux servers and workstations is not enabled by default and must be enabled in the system settings. Do not be concerned that the imported certificate is not displayed in the authconfig UI later during the process. You cannot see the certificate in the UI; it is obtained from the /etc/pki/nssdb/ directory during authentication. In the top menu, select the Application menu, select Sundry, and then click Authentication. Click the Enable Smart Card Support check box. The Card removal action menu sets the response that the system takes if the smart card is removed during an active session. The Ignore option means that the system continues functioning as normal if the smart card is removed, while Lock immediately locks the screen. The Require smart card for login check box sets whether a smart card is required for logins. When this option is selected, all other methods of authentication are blocked. Do not select this until after you have successfully logged in using a smart card. By default, the mechanisms to check whether a certificate has been revoked (Online Certificate Status Protocol, or OCSP, responses) are disabled. To validate whether a certificate has been revoked before its expiration period, enable OCSP checking by adding the ocsp_on option to the cert_policy directive. Change every cert_policy line so that it contains the ocsp_on option. Because of the way the file is parsed, there must be a space between cert_policy and the equals sign. Otherwise, parsing the parameter fails. If the smart card has not yet been enrolled (set up with personal certificates and keys), enroll the smart card. If the smart card is a CAC card, create the .k5login file in the CAC user's home directory. The .k5login file is required to have the Microsoft Principal Name on the CAC card. Configure the /etc/krb5.conf file. The settings vary depending on whether you are using a CAC card or a Gemalto 64K card. With CAC cards, specify all the root certificates related to the CAC card usage in pkinit_anchors. In the following example /etc/krb5.conf file for configuring a CAC card, EXAMPLE.COM is the realm name for the CAC cards, and kdc.server.hostname.com is the KDC server host name. In the following example /etc/krb5.conf file for configuring a Gemalto 64K card, EXAMPLE.COM is the realm created on the KDC server, kdc-ca.pem is the CA certificate, and kdc.server.hostname.com is the KDC server host name. The command is useful for diagnosing problems with using a smart card to log into the system. There are other configuration options for smart cards, such as changing the default smart card module, setting the behavior of the system when the smart card is removed, and requiring smart cards for login. Once smart card authentication has been successfully configured and tested, then the system can be configured to require smart card authentication for users rather than simple password-based authentication. Do not use the --enablerequiresmartcard option until you have successfully authenticated to the system using a smart card. Otherwise, users may be unable to log into the system. Red Hat Identity Management supports smart card authentication for IdM users. For more information, see the Linux Domain Identity, Authentication, and Policy Guide. The following smart cards and readers are supported on Red Hat Enterprise Linux.